Bruce Galimore could have had something to celebrate this Christmas. On December 26th, he could have been released from parole and be on the way to getting his 22-year-old life heading in a new direction. Instead, Galimore will almost certainly be in Cook County Jail on Christmas, looking at the very real possibility of a fresh, years-long prison sentence. Police on Thursday morning arrested Galimore in Uptown after a nearby Staples store was robbed at gunpoint of two computer tablets. Store employees reported that Galimore ripped an iPad and a Samsung tablet from a display case, then ran out of the store at 4610 North Clark with the outlet’s manager following close behind. When Galimore noticed that he was being followed, he pulled out a black handgun, pointed it at the manager and threatened him, police said. Cops caught up with Galimore a few minutes later in the 4600 block of North Magnolia. They say they recovered a gun from Galimore’s possession—it turned out to be a replica. Prosecutors yesterday charged Galimore with three felony counts of armed robbery with a firearm, one felony count of robbery while indicating that he was armed with a firearm, and felony retail theft. Details of what led to the additional robbery charges were not immediately available from Chicago police this morning. Galimore is due in bond court this afternoon. State records show that he was paroled on Dec. 26th last year after serving half of a three-year sentence for possessing a stolen motor vehicle part of a two-year sentence for escaping electronic monitoring. 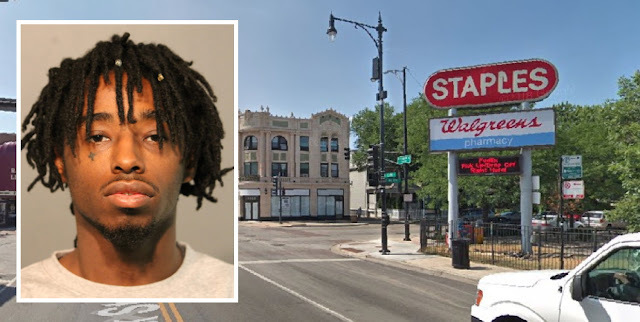 Chicago police records indicate that he has been arrested three times since late September: twice for shoplifting in the area of Belmont and Clark and once for shoplifting in Chinatown. The statuses of those three shoplifting cases were not immediately available today.